Recently I traveled to the DMZ with a group of youth from the Cayuga-Syracuse presbytery. We were on a week long journey in South Korea, where we enjoyed the hospitality of our mission co-workers and YAVs in Daejeon a city of about two million people, and the people of the Ilsan-Hosu Presbyterian Church just outside of Seoul. 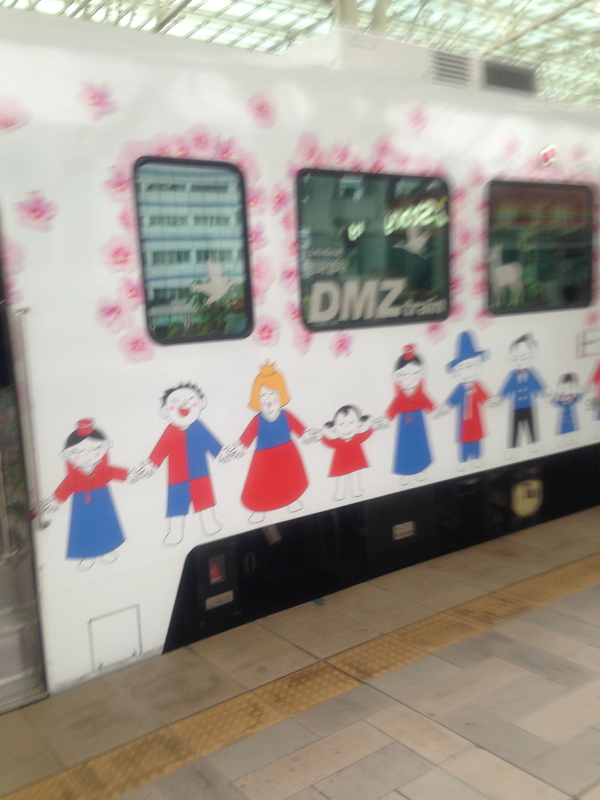 We were able to see the beauty of Korea as we traveled by train, bus, and car in many directions. We even stood on the beach of the Yellow Sea outside of the Incheon airport. It was a week of beauty, miracles, and unexpected surprises around the most unlikely corners. On Tuesday, we awoke early and headed over to the train station and ate breakfast as we waited for departure. We needed to have our passports and fill out paperwork that would allow us to enter and then exit the area known as the DMZ, a line of demarcation between the two Koreas. We were not traveling to the usual spot for this experience. We were going to Dorasan Station, what we were to learn was the spot where the seperation was the most lean. It was only the beginning of what would be a time of mystery, tension, and amazement. The train itself was a vessel of hope and joy. Bright colors and symbols of hope, peace and harmony were written on a myriad of languages on the inside walls. Music and pictures meant to uplift the traveler filled the cabins and on the return trip a few games and pictures were taken to help relieve the tension of the day. We left the train behind and the counting started. Almost every door had someone counting off those entering and those exiting. At some places two folks counting, making sure that the numbers were correct, and even the bus driver made sure that he had exactly the right number of riders. Once at the station we placed our bags in some lockers and headed down a tunnel into the earth. We picked up our helmets and headed straight down. This access tunnel was cut to intercept a tunnel that was being carved out by the North Korean army, and it was discovered only by accident. At the end a wall and observation port had been constructed and this was only the first of four such spots to choke the tunnel off. We learned that this was the third of four tunnels that had been discovered but the belief was that there were many more. After returning to the surface we were able to see another video and some museum displays of artifacts that have been discovered around the Station. Back on to the bus and off to the observation deck and another video describing all that we were seeing and how the landscape has changed since the armistice was signed in July 27 of 1953. The video shared of Kaesong, which is an industrial area in North Korea that is still open to commerce with the South, and the black structure at it’s heart that dominates the view. The most striking aspect of our time here was the idea that this place, sometimes called the largest mind field in the world could be a place of peace and reconciliation for the world, a place where the lines that separate us might be erased. Today it is a nature preserve full of the flora and fauna of the Korean peninsula. Our day although busy and full was an amazing window into the peace process and the hope that South Korea has for the future. Now is the time for us to pray for Korea, for the war-torn nations of the world, and for the peace of Jerusalem. Amen.